Our menu is affordable for all with suggested prices of $6-$9. Any donations over the suggested price help to cover the cost of a neighbor’s meal. In this “pay what you can afford” concept, the hope is that customers will “pay it forward” and pay more than the suggested price to help feed our neighbors. Breakaway Omelet Served with potato hash and multigrain toast. Choose up to 4 ingredients (additional $.50 each). Toppings: Lettuce, tomato, pickle, onion, sautéed onions, sautéed mushrooms, jalapenos. Cheeses: Cheddar, Swiss, Pepper Jack, American, Provolone. Italian Panini Ham, salami, pepperoni, provolone, banana peppers, lettuce, tomato, red onion, and Italian dressing on focaccia bread. Fried Green BLT Fried green tomatoes, bacon, and lettuce with bacon aioli on toasted bread. Cuban Braised pulled pork, ham, salami, provolone, pickle, and spicy mustard on toasted ciabatta. Bistro Club Wrap Ham, turkey, bacon, lettuce, tomato, ranch, and smoked cheddar cheese toasted in a tortilla wrap. Reuben Shaved corned beef or turkey, Swiss cheese, sauerkraut, and Thousand Island dressing on thick cut toasted rye. SAG Wagon Braised pulled pork, house made barbecue, and smoked cheddar cheese on a toasted bun. All sandwiches served with choice of house salad, kettle chips, or seasonal fresh fruit. 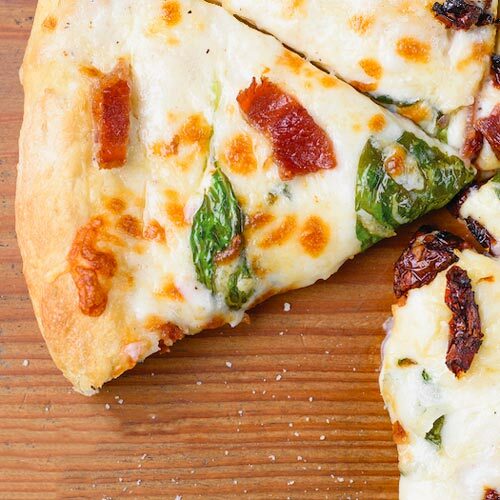 Gourmet Pizza Choose up to 4 toppings (additional $.50 each). Toppings: Pepperoni, sausage, bacon, ham, Canadian bacon, smoked cheddar cheese, specialty cheese blend, mushrooms, onions, sautéed onions, bell peppers, jalapenos, olives, tomatoes, banana peppers, spinach. Peloton Braised pulled pork, ham, bacon, house made barbecue sauce, specialty cheese blend, and smoked cheddar cheese. Vegetable and Pesto Pesto, Portobello mushrooms, roasted vegetables, caramelized onions, tomatoes, specialty cheese blend, and fresh mozzarella. Margherita Garlic oil, tomatoes, specialty cheese blend, and fresh mozzarella topped with balsamic glaze and fresh basil. 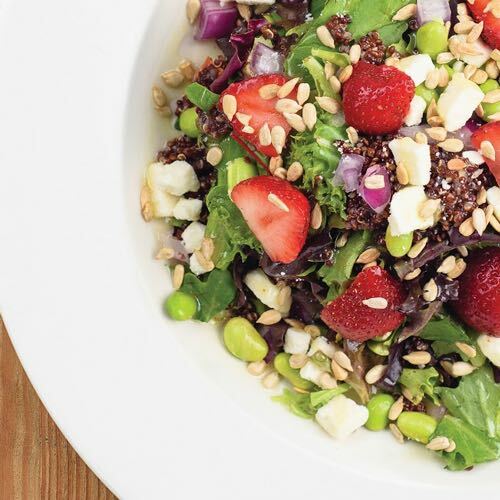 Strawberry Quinoa Mixed greens topped with strawberries, quinoa, edamame, sunflower seeds, red onion, and feta cheese with choice of dressing. Caesar Romaine lettuce topped with house made croutons, parmesan cheese, and Caesar dressing. Trek Roasted vegetable mix (squash, carrots, asparagus) and feta cheese on a bed of spinach with choice of dressing. House Made Dressings: Balsamic Maple Vinaigrette, Sweet Onion Vinaigrette, Lemon Honey Vinaigrette, Ranch, Honey Mustard, Caesar. Other: Italian, Bleu Cheese, Thousand Island. Pick Two: Soup or Salad and Half Sandwich Choice of soup or house salad (mixed greens, tomato, cucumber, and red onion) and half sandwich of chef’s daily selection. Hearty Chicken Noodle Brimming with chicken, vegetables, and noodles. Soup Du Jour Chef’s daily fresh soup selection. Served with choice of chips or apple sauce. Coca-Cola Products, Snapple, Lemonade, Bottled Water, Sweet Tea, Unsweetened Tea, Orange Juice, Cranberry Juice, Milk, Coffee, and Hot Tea. We have a for-profit catering business with services available for company luncheons, private parties, or other special events. Profits from our catering business support the café’s mission. For more information, please email info@onebistro.org or call 937.736.2358. We appreciate the opportunity to serve you! *The consumption of raw or undercooked eggs, meat, or poultry may increase your risk of food borne illness. To place an order, call 937.736.2358. Click to download our to go menu!